Easter has come and gone and i really didn’t have enough time to make my kids a funny bunny bag each. I knew i needed to whip something up for them to collect eggs, and i had to do it in a short time. I made some cute 10 minute Treat bags. These are perfect for Halloween, Birthday parties, as little bags to hold soft toys on a car trip! My boys love their star wars ones, and these two i made i’m saving for the next birthday party! This tutorial is so easy and will take you 10 minutes or less! one 11″ x 22″ bag piece and two 3″ x 11″ strap pieces. Overlock, zig zag or edge stitch the long edges on the bag piece. on mine i decided to edge stitch. You could also do french seams! To make the straps fold the long sides in half wrong sides together. Press open and fold both sides into the middle to the centre line just created. Press and fold in half again. Press well. Open up the strap and attach the fusible fleece to the centre of the strap piece on the wrong side. Refold and press the strap again. Stitch 1/8” in from the seam down each long side. Do this for the other short side.Then open the folded short sides out. Fold the bag piece right sides together with the short edges together stitch down each side with 3/8″ seam allowance leaving the top (folds) open. Pull the bag right side out. Mark 2 1/2″ from each side seam. Place the short side of the straps to the side of the mark you just made and baste stitch 1/4″. turn the bag inside out again. Fold over the previously folded top. Folding up the straps with it. Stitch around the top of the bag 1/8 from the bottom folded edge. Ensure that you are sewing over the straps folded up. Turn the bag right side out and press. A great little treat bag. This bag can be made longer or wider easily. Check out my other Tutorials and Sign up for my newsletter to get a FREE Bag sewing pattern! Awesome and easy tutorial.Thanks for sharing! I absolutely love this! 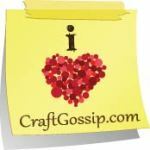 If you have any more easy sewing projects for beginners like me please don’t hesitate to share the love! Thanks in advance!